I received this Rachael Ray Yum-o! 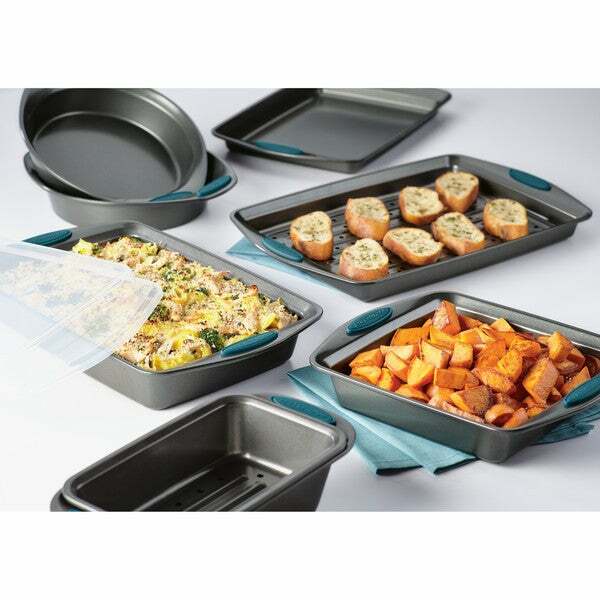 Nonstick Bakeware 10-Piece Oven Lovin' Bakeware Set as a gift. It seems to be a very high quality bakeware set, very non-stick. They did send it with the orange grips rather than blue, but Overstock resolved this right away. They have the best customer service! Take the guesswork out of assembling an essential bakeware collection with the versatile Rachael Ray Yum-o! Nonstick Bakeware 10-Piece Oven Lovin' Bakeware Set. Featuring eight baking pans in seven popular sizes, this practical set can handle cakes, lasagna, meatloaf, roasted potatoes, brownies and more. Made from heavy gauge steel, the pans resist warping and feature long-lasting nonstick that provides excellent food and baked good release with easy cleanup. Enjoy the convenience of a bakeware set that helps create everything from Rachael's Eggplant Parm and Four Cheese Baked Pasta to her Almond Joy Layer Cake or Espresso Brownies. The pans' bold-colored, extra-wide grippy handles offer a confident grasp when pulling items from the oven, and they are oven safe to 500°F. As an added bonus, a portion of the proceeds from this purchase goes to Yum-o!, Rachael's nonprofit organization that helps kids and their parents develop healthy relationships with food and cooking. These versatile baking pans are the perfect complement to many other pieces in Rachael's bakeware and cookware collections that always spell fun in the kitchen. Turn up the heat and bake some excitement - with the Rachael Ray(r) Yum-o! (r) Nonstick Bakeware 10-Piece Oven Lovin' Bakeware Set. Love my Rachael Ray bakeware set! It cooks perfect in the toaster, broiler & oven. Wipes clean easily and food does not stick to the pan. COLOR matches perfect in my kitchen! Great set. Great quality. I especially like the rubber handles. We are cooking more and our old bakeware is worn out.